Teach To Stamp: Stamp Club! I've been away from the blog for a while. We've had a string of bad news for people who are close to us and I've spent a lot of time and energy dealing with the various situations. Thankfully we haven't had any news for the past couple of weeks, and I'm hopeful that the bad news is done! 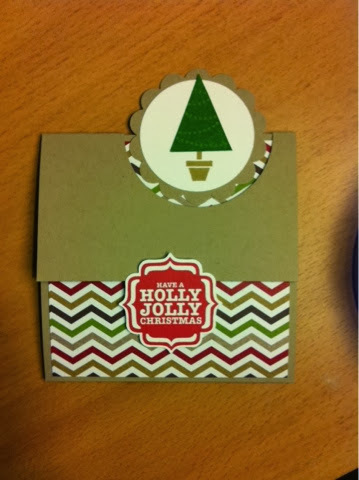 The following projects are from the December stamp club class. We made a Christmas card, a birthday card, and a fun gold gift card holder. All about the framelits! 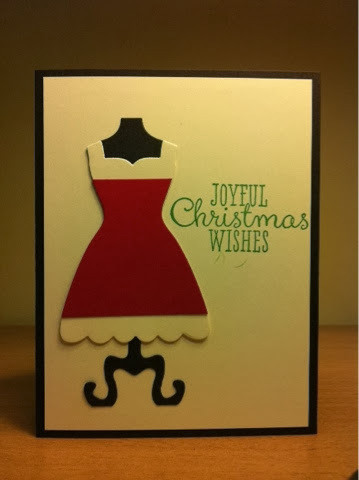 I had seen a few cards around the web using the dress framelits to make a Mrs Claus dress, and since a few people have bought framelits lately with the weekly sales, I knew we had to make this card! It came together really fast too, once you run the card stock through your big shot you're almost done! The sentiment is from Joyful Christmas. I just love how the C in Christmas echoed Mrs Claus' cute little waist line! 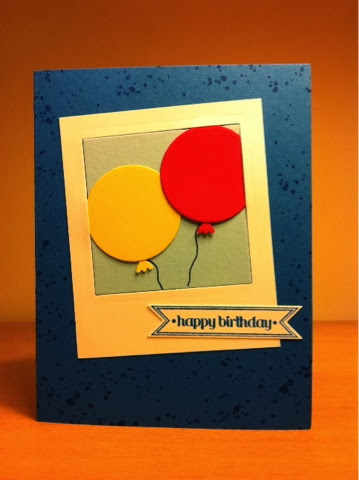 This card is for all those December birthdays!! We haven't forgotten about you in the hustle and bustle. This card is also all about framelits! We used one of the square framelits to cut the opening in the 'polaroid' and one of the circle framelits for the balloons. The little tied part of the balloon is owls foot from the owl builder punch, we glued it to the back if the circle. The sentiment is from Itty Bitty Banners and cut out with the Bitty Banners framelits. Whew, my Big Shot really earned it's place on my craft shelf tonight! Pretty cute! This project is all about the punches. I got this idea from another blogger who posted a video of how to make them. Unfortunately, since I'm so delayed in posting this I'm having trouble finding the video for you. I'm going to keep looking. Hopefully I'll find it and come back to add the link. I love this template because by switching out the stamp set you can use it for a birthday or thank you, or anything you need.